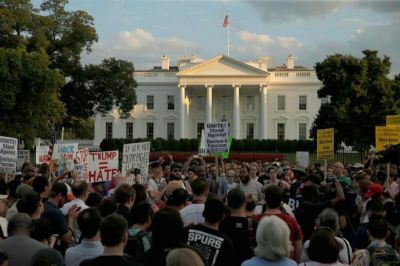 The one-year anniversary of the melee in Charlottesville, Virginia came and went recently. A poll found that most Americans feel that race relations in this country have worsened. Writing for cbsnews.com (8/12/18), Anthony Salvanto pens, "One year after the deadly rally in Charlottesville, Virginia, most Americans feel racial tensions have grown over the past year." Indeed, on the first anniversary of the melee, even an NBC news reporter and crew got attacked by Antifa in Charlottesville. Newsbusters of the Media Research Center reports (8/12/18): "Late Saturday night, NBC News reporter Cal Perry and his crew were in the thick of it as Antifa members ganged up on them and attacked. The next morning, NBC's Sunday Today ignored the attack and suggested the media was simply 'heckled' by their assaulters." Apparently this was not an isolated incident of violence by Antifa, et al. Meanwhile, there's another side to Charlottesville that I wish would get the same kind of attention as did the negative events. The media generally ignores this story. Christian leaders in Charlottesville, black and white, have organized a series of measures, including bi-racial prayer services, to bring about healing for the city. This included a prayer walk around the city with a black minister (Rev. Alvin Edwards) and a white minister (Rev. Mark Beliles) holding hands. Bishop Harry Jackson spoke at that event late last year. Their website, Healing4Charlottesville.com, documents the various steps churches are taking for racial healing in that city. I've written about this before, but what I found to be the most significant aspect of Healing 4 Charlottesville has been the fact that more people from that city participated in the Christian prayer services on December 1 and 2 than people from Charlottesville participated in the big brawl on August 12. Meanwhile, over this last weekend, they had additional Healing4Charlottesville prayer events. Witt told me, "Like so many things, [racial healing] can be slow. It can be tedious. It can be frustrating. But there's movement in a good direction in Charlottesville." And he added, "I believe the world is quickly running out of answers to the problems we face in our nation. And here is a grand opportunity for the church to stand up and share....Bringing black pastors and white pastors together, under the banner of Christ, is really about racial healing....There are some wonderful things that are happening in Charlottesville." Two of the speakers in the Christian service for Healing 4 Charlottesville were the descendants of a slave-owning family (Matt Lockett) and of a slave family (Will Ford) "owned" by the Lockets. Healing4Charlottsville.com notes: "Their stories are linked together. Ford's ancestors were Locketts deriving their name from the family in Virginia that enslaved them until the last major Civil War battle happened on their farm, three days before the surrender of Confederate General Robert E. Lee. Ford is the director of Christ for the Nations Institute (Dallas) and Lockett is the director of Justice House of Prayer (Washington)." Witt says that Lockett and Ford met at a pro-life event in Washington, DC about a decade ago and learned of their historical ties and of their common bond in Christ. Only Jesus can bring about this kind of unity. Meanwhile, there was one pro-Christian story about Charlottesville that did make it to the evening news. Ken Parker of Jacksonville, Florida, attended last year's rally in Charlottesville so that he could "stand up for my white race." He had been involved with the KKK and an American neo-Nazi group for six years. Parker even apologized in McKinnon's church: "I said I was a grand dragon of the KKK, and then the Klan wasn't hateful enough for me, so I decided to become a Nazi—and a lot of them, their jaws about hit the floor and their eyes got real big...But after the service, not a single one of them had anything negative to say. They're all coming up and hugging me and shaking my hand, you know, building me up instead of tearing me down." Jesus is the key to America solving its racial divide. As Georgia pastor Garland Hunt put it: "God's solution for a divided nation is a united church." If only that message could get on the evening news (more often).